Context Matters. Let us talk Outlander, shall we? Are there differences between the reality of a fictional book world and the reality of a fictional television drama and the reality of reality? But it wasn’t in the book, you continue to lament! You love Frick and Frack Tweedle, aka Angus and Rupert, and yet they are not anything like they are in the books, where they are scary, dour and large. They are comic relief on the show, and yet, you have come to love The Tweedles. You who know their fates are asking that those be changed, because we love them so much. Why can you accept the Tweedle’s place in the adaptation, embrace them (the typical TV trope of numskull neighbors), but you can’t handle that TV Jamie is maybe a wee bit more romantic than book Jamie, who bought a ring instead of having one made, or is an inch shorter on screen than in real fictional life? None of this actually happened! The sole reason I can see that Jamie had a handmade ring on the TV show was because they needed to find something for the Tweedle’s to do that created a wonderful soft comic moment, that fell into the rhythm of the flashback storytelling of The Wedding. It’s the symbolism of the the ring that is important, not it’s design, composition or origin. A ring made from the key to his home (?—Not verified, but strong indicators are that it’s a key to Lallybroch) indicates an acceptance and willingness to fully embrace Claire. She is part of WE now. And, we have to learn to TRUST RON. There will be pieces that move around (or get lost) for a better telling in episodic TV. You are not going to go back and read the book and discover it’s now a key. The book you love isn’t changed. Can I insert here that that concept –of electronic books, especially history books, being changed to suit what the ruling class wants you to know is a continuing fantasy/horror/dystopian nightmare of mine? None of the costuming is accurate, historically, because even if the wool was spun by hand in a room lit by candles on a treadle spinner, the sheep the wool came from wasn’t even born in 1743, so it’s totally inaccurate. I am not interested in coming off like a sycophant, but really there are so few things that actually bother me about the show. I am looking at the big picture. It IS a ripping good yarn, as show runner Ronald D. Moore points out, and it deviates almost immediately from formula because Diana Gabaldon WASN’T writing it for publication, but to learn how to write a novel. Or so we HAVE to believe, because Herself SAYS so, and were you there to disprove it? Ok, a bit of “aw shucks” about the retelling of such a happy accident; how much is what she wants the story to be? Or better yet, why do we question it? It is the story of OUTLANDER’S birth. It was a practice novel, and, the hero and heroine marry early in the novel. Already not a romance by the numbers. And, 8000 or so pages in, they are still in love, and are grandparents. Much more than an epic love affair, OUTLANDER begins a multi-generational sweeping historical fiction series of novels. In Diana’s ORIGINAL story, OUTLANDER, the first of 8 books, Frank is a cipher. By WRITTEN IN MY OWN HEARTS BLOOD, he is a very different man, and one who, in my humble opinion, is a more sympathetic character. Whether Diana had always intended for him to be more complex, or whether he showed up and wouldn’t leave, he is much more than one note. He is actually a note on the show that a lot of folks don’t want to accept, because they are all about ALL Jamie/Claire, all the time. A lot of those readers are not particularly interested in the history, the tapestry she weaves, the other characters stories. How many times I have read people say, get on with it, stop writing about battles, about Willie, about Bree, about… well, about anything that isn’t 100% Jamie/Claire-centric. Those readers are totally missing what this is all about. I hope that viewers will embrace the fullness of the story. We have had to wait over 20 years for this to become a TV show. And we were then given only eight episodes of magic. And some complain about that, too. Then some complain that we have to wait too long for part two. So, one more itty bitty thing. We are Diana Gabaldon fans. April 4, 2015? 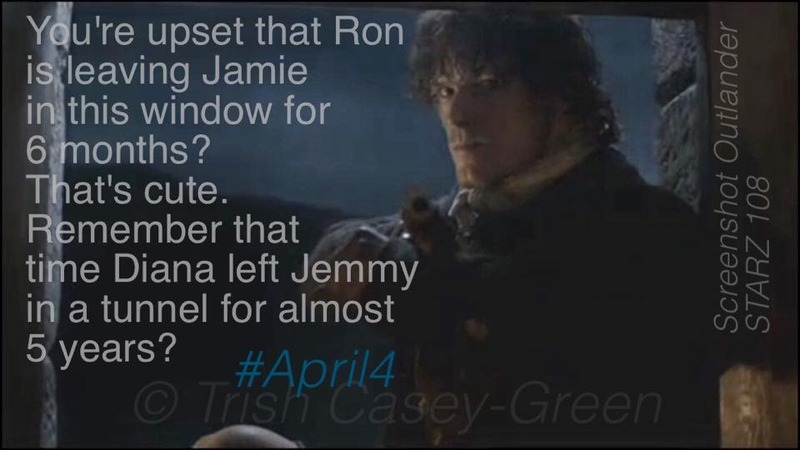 Jamie can perch on a windowsill that long. We’ve got this. And now, some will complain about something else entirely. Let the wailing and gnashing of teeth and the carrying on of ‘The Reckoning,’ 1.9 begin. As fiction, THIS IS the way things were, in THIS world, whether or not it’s historically accurate or not acceptable today. Jamie and the men were put into amazing bodily peril by Claire not truly understanding the danger she was walking into. A woman of the 20th century believes in a civility and world order that is vastly different than where she ended up. In order for his men to continue following Jamie, for him to be able to lead, he has to make SURE Claire understands, and he points out that her punishment is mild compared to what one of the men might receive. The punishment is measured, but not in anger or fury. It is to show that he is in charge, that he takes the protection of his people seriously, that there is justice and that there are consequences to actions. This is incredibly different from the modern husband smacking his wife around and bloodying her nose because she didn’t bring his beer fast enough or because dinner was not hot enough. The larger point is—he sees Claire as an EIGHTEENTH CENTURY woman who is being willfully disobedient, who should know the consequences of her actions and yet still puts them all in danger, all for a nebulous bit of wandering around. He has no clue she was trying to go forward in time, to get back to Frank. For all we know, he could think she has turned on them and actually is a double agent. Jamie has one piece of information withheld from him that would make it all different. If Jamie were aware that Claire was from a different time, she would explain her thoughts about strapping, and he would explain his reasoning to her. But because he has no reason to think she wasn’t from his time, he would think she would know, expect, assume the consequences of her actions. He doesn’t know any better than to use corporal punishment, not because of a big moral failing on his part, but simply because that’s how it was then. A wife was property. Legally, a husband could punish his wife for disobedience. Or, a father could have his daughter beaten for disobedience. Just a few episodes (chapters) back, the community at large was willing to allow a teenaged girl to be beaten in front of them in the Great Hall for disobedience. (How many of us who know the future wish Jamie had just let Rupert have at Laoghaire?) And remember, too, that Colum Mackenzie was the law. There are no Edinburgh policemen to enforce law. Just the laird. This is one episode—But this is the very, very beginning of an 8000 page love story. It’s brutal, it’s bloody, it’s real (fictional real). Jamie becomes a man among men through his experiences. He learns from Claire. He becomes a better, more rounded, and definitely a more modern man, because of Claire. Of course, your mileage may vary. If you have had intimate experience with abuse or with sexual assault, it may be a difficult thing to let go by. It isn’t glorifying these things, but it isn’t shying away from them, either. It can be jarring. It ISN’T real, though. Except in it’s own world, it is a work of fiction. There is this website called StoryWonk. The couple who run it are dedicated to the idea of “story.” They have done an episode by episode podcast, and at hiatus started a seminar for the book.Listen to Scott and the Sassenachs seminar for Outlander. It’s a 17 episode podcast that takes apart the story chapter by chapter, and gives great insight into the story—the structure of it; the good the bad, and ugly. It is like taking a college literature class devoted to one book. It draws your eyes to the incredible story telling as well as the deeper meanings that can be found implied in the text. I’ve read the book more than a half dozen times, and yet this seminar has drawn my attention to any number of things in a new way. Fascinating stuff, by very interesting people. *I welcome discussion about this topic. Because I know it is very, very subjective and delicate, I ask that you respond with the same civility that you would if we were standing face to face.